Coordinator, Block Project Assistant and District Coordinator, District Project Assistant Jobs. 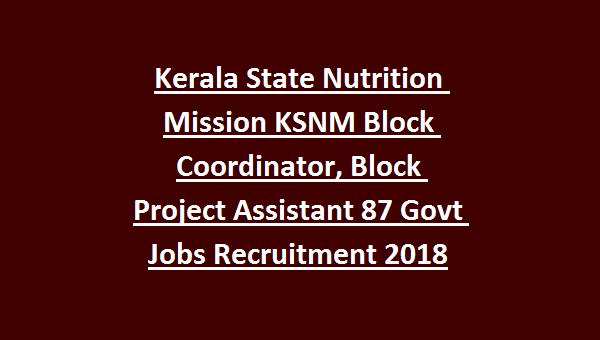 There are total 87 vacancies in this Kerala State Nutrition Mission vacancies recruitment 2018. Initially based on qualifications and experience candidates will be short listed and those who are in short list, they are only eligible for the written exam for this CMD KSNM Block Project Assistant Recruitment 2018. Online application form submission last date for this KSNM vacancies is 12-12-2018. Official website to apply online is www.cmdkerala.net. Detailed information of Kerala State Nutrition Mission recruitment age limits, pay scale, qualification is updated below. 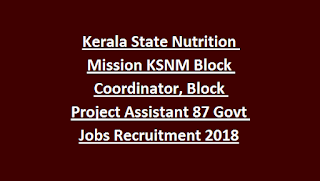 There are total 87 vacancies in this Kerala State Nutrition Mission recruitment 2018. For Consultants upper age limit is 40 years and for all other posts upper age limit is 30 years. For Block Project Assistant/Block Coordinator Posts-Engineering degree qualified candidates are eligible. Candidates must have 1 to 5 years of work experience for applying this Kerala State Nutrition Mission Jobs. Candidates will be short listed for written exam based on experience and qualifications. Short listed candidates only called for written exam. Apply online for this KSNM vacancies through official website of www.cmdkerala.net. Last date to submission of application form online is 12-12-2018. Written Exam details, admit card release date and other details will be updated in this website only.